Because we are such kind hearted individuals, we like to give something away for free. If you find it useful then please let others know. A simple text-based telnet client that has been written with MUCKs, MOOs, and MUDs very much in mind. If you're looking for something easy to use but better than the Windows telnet client, then you can't go far wrong with this. Installation of WyrmNet is simple. All you have to do click the link below and select 'Run'. This will install WyrmNet and put a shortcut to it in your Programs menu under 'Wyrm Software'. Click here to download WyrmNet. Click here to view the Help Guide. If you've ever searched the web for some way to convert feet to metres, miles to kilometres, or pounds to kilogrammes and found it a hassle then this is for you. 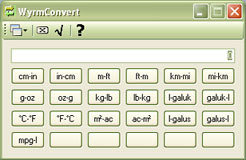 This is a desktop application that allows you to convert between all sorts of measurements easily. Installation of WyrmConvert is simple. All you have to do click the link below and select 'Run'. This will install WyrmConvert and put a shortcut to it in your Programs menu under 'Wyrm Software'. Click here to download WyrmConvert. Ok so there are other dice applications out there, but we wanted a simple way to choose the number and type (d100, d20, d12, d8, d6, and d4) of dice we were rolling. You can enter an additional number too so you can roll gaming type rolls such as 2d8+4. Installation of WyrmDice is simple. First make sure your Windows Mobile device is connected through ActiveSync, then click the first link below and select 'Run'. This will install WyrmConvert on your PC after which it should synchronise with your Windows Mobile device and install itself on there. Alternatively you can click the CAB file link and download straight to your Windows Mobile device. The device must have the .NET Compact Framework V2.0 (SP2) installed - included as part of Windows Mobile V6. Click here to download WyrmDice. Click here to download WyrmDice CAB file. Contact us with any queries about the free software.